This post is a continuation of the food that we had during the high tea buffet. We had so much food in an afternoon, and I blamed everything on the Barracks cafe. Many people raved about the skinny pizzas at Barracks Cafe, and I will talk about them in a minute. 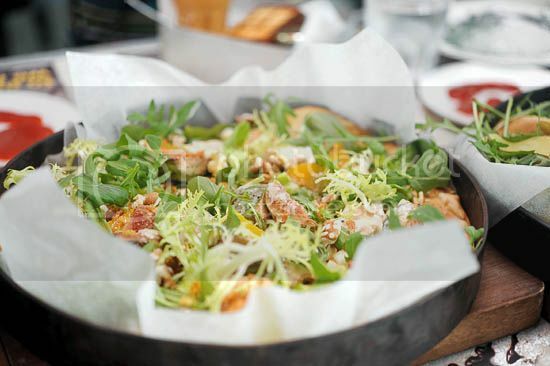 If you are too lazy to travel all the way to Dempsey road, they are also available at the Skinny Pizza Cafe which has branches at Wheelock, Raffles City and Suntec. We tried three skinny pizzas ($25): Salt Cod Brandade, Grilled Figs With Parmesan Crumble, and the Ahi Taki. Half the time, I wasn’t sure which one I was eating, but I finished all of them anyway. 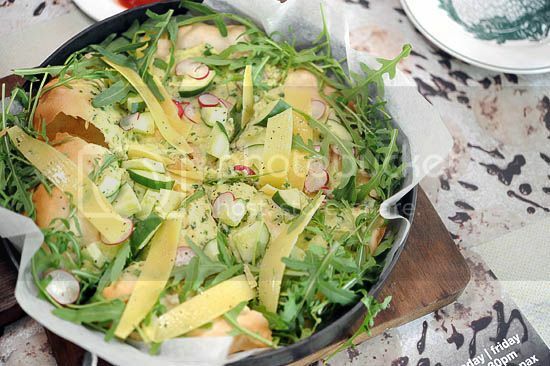 All the pizzas were not bad, but they were somewhat too healthy and wholesome – not exactly my idea of pizzas. The famous truffle fries from Barracks Cafe, House Dempsey. All the other food bloggers love the Truffle fries ($9). They had it while having the skinny pizzas, they also had it while having some of the items from the afternoon high tea buffet. And you know what? they ate it with the desserts too. We had at least four-five servings and there wasn’t any left when we were done. 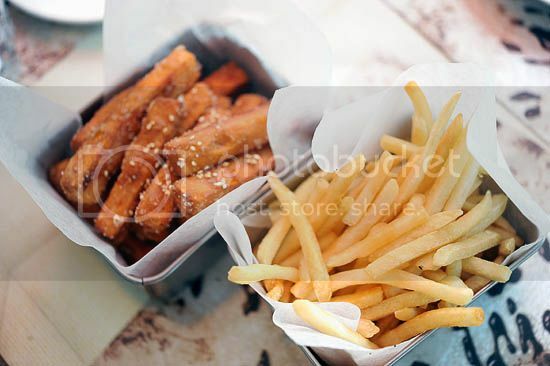 The fries were drizzled with truffle oil, which gave them a smokey aftertaste. It had a gasoline smell, and while I had my fair share of it; I’m not convinced to pay nine bucks for fries. Give me a dessert anytime! 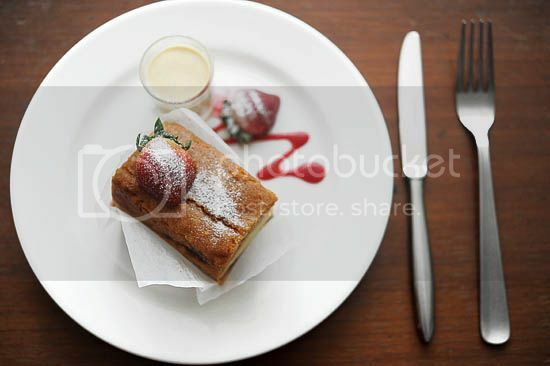 Now, the cake in the picture above, is the popular Strawberry Shortcake ($9.50) from Barracks Cafe, House Dempsey. If you ask someone (who has been to House before) for recommendations on what desserts to order from Barracks Cafe, chances are, they will tell you: strawberry shortcake. I couldn’t quite possibly describe it, but the strawberry shortcake at House Dempsey was very different from the ones we usually have. For a start, it wasn’t as fluffy and soft like the ones from the Japanese patisseries. Filled with fresh (but sour) strawberries, and poured over with vanilla bean cream — oh honey, I’m in love. Everyone loves strawberry shortcakes, I mean does it even make sense that you will not want to eat it? Anything and everything can be made better with hazelnut. Take the chocolate cake for instance, it’s a lovely thing on its own, yes nobody can resist it, but the cake is often too sweet and people always struggle to finish the whole slice. But with the addition of hazelnut, it becomes something more than that. It’s no longer an ordinary death-by-chocolate cake. 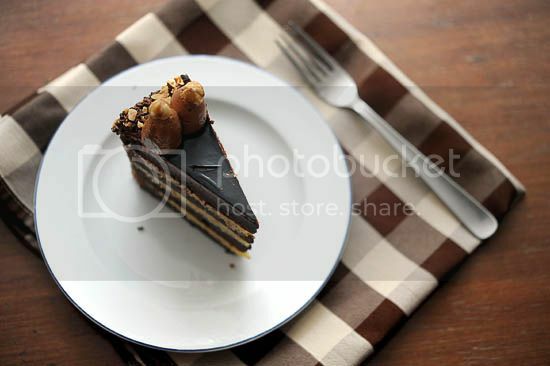 The Chocolate Hazelnut Gateaux ($12) is much more sophisticated, preferably enjoyed with a glass of cold milk. I’m not sure if it’s because we had too much desserts, but the chocolate hazelnut cake wasn’t my favorite among the ones that we tried. 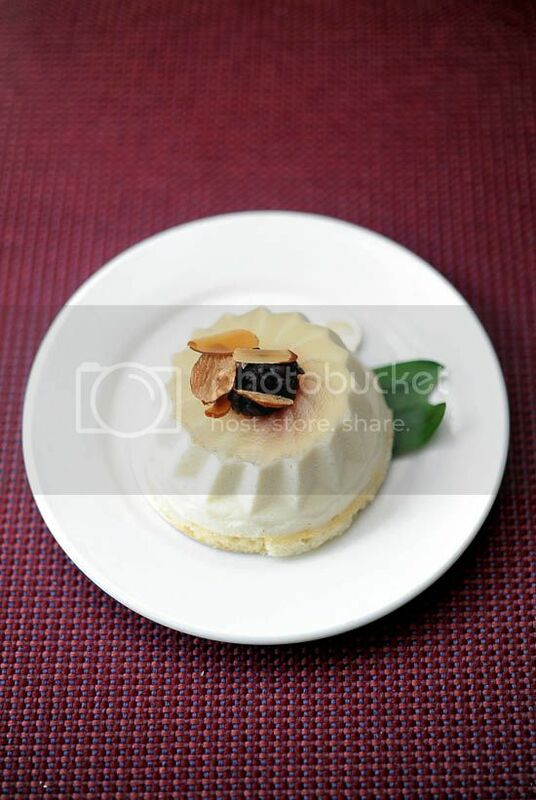 My favorite dessert was the Lemon Cake ($12), and no, it’s not the one in the picture. I don’t remember having much of the Pandan Jelly Sponge (above picture) and the Passionfruit Kachang, but I absolutely love the Barracks Cafe’s lemon cake. It was sour, and I mean it in a good way. Most of the food bloggers preferred the Passionfruit kachang, and they only took a small spoonful of the lemon cake as they found it to be too sour. But I love citrus fruits, and I managed to finish most of the lemon cake by myself. Tell me, which dessert are you? I’m a lemon meringue tart. Or maybe a chocolate hazelnut praline cake. Wait, I think I’m a chocolate souffle too. Oh whatever, just tell me about you. omg hahah i said the same thing about the fries when i had them. i was like why smell like petrol?! i prefer normal fries actually. never try the squid ink skinny pizza, v nice! Oh, these all sound wonderful. I am a mixed fruit-and-chocolate crepe… delicate, refined and complex. Your photos always makes the food looks more delicious than it actually is. How about taking some nice pics of the 1m long sausage from Barracks Cafe. Yes, you sure loved the lemon cake. You practically demolished it single-handedly! Hee hee! Squid ink pizza! The best of the lot, imho. Try it on one of your (i’m sure will many) future visits. I agree that the fries taste like gasoline. I didn’t like them very much, but i’m biased, cos i prefer steakcut over shoestring. Have only tried the Squid Ink pizza and another one along the lines of Vietnamnese Chicken-something. Haha don’t rem the names as the food was ordered before I arrived. Both pizzas were yummy! Agree with you that they’re the “healthier choice” version kinda pizza haha.. If u find the time do try out the pizzas and other dishes at Pepperoni Pizzeria @ 6 Greenwood Ave…its thin n crispy n yummilicious!! The mushroom pizza was delicious! i’m totally head over heels for the lemon cake at house and recently, i cant stop thinking about it! i’ve this impulse to try making it myself but then again, i might just try my luck at the skinny pizza outlets in town for my quick fix, if they do offer it. btw, i ordered the coconut and passionfruit cake (unfortunately not the lemon one!) on my 2nd visit and it was just blah. but the lemon cake was oooh!